D.J. Fontana, 87, died in his sleep on Wednesday evening, June 13. He played drums for Elvis Presley from 1954 to 1968, both onstage and on approximately 460 recordings. A native of Shreveport, Louisiana, he taught himself to play drums by listening to big band records. Hired in 1953 as house drummer for the Louisiana Hayride, he backed future stars such as Webb Pierce and Faron Young. And Elvis Presley in late 1954. “They sent Elvis’ records from Memphis. I thought the sound was really incredible,” he told The Tennessean in 1984. “It was really different. … When Elvis, (guitarist) Scotty Moore and (bassist) Bill Black came down as a trio, Scotty approached me about drumming with them. We ran through about two or three songs backstage.” After moving to Nashville in the 1960s, Fontana became a sought-after session musician. He was a member of the Rock and Roll Hall of Fame, the Musicians Hall of Fame, and Rockabilly Hall of Fame. Forty-three years after Buck Owens and the Buckaroos recorded the Capitol Records album, Country Singer’s Prayer, Ominvore Recordings will release it on August 17. The Tennessean reports the title track was released in 1975, but the project was shelved when the single failed to chart. The Los Angeles-based Omnivore label earlier released Don Rich Sings George Jones. Buck Owens, who died in 2006, would have turned 89 on August 12. The first Cracker Barrel Country Legend Award, designed for an artist with decades of experience in influencing country music, was presented to Randy Travis during Warner Music Nashville night at CMA Music Festival. Randy accepted the trophy and a $5,000 donation to the CMA Foundation in his name. The Tennessean reports the night was memorable for another reason. It was the first time Randy wore blue jeans and boots since his stroke. A custom-made pair of double-zip boots supported his legs and ankles to replace his braces. The Wranglers had been in his closet since 2013. A history-making event has occurred on Billboard’s Hot Country Songs chart, which measures the most popular country songs in the U.S. every week. When the new Florida Georgia Line single, “Simple,” reached the Top Ten, it joined two of the duo’s songs already there. It’s only the fifth time an artist has had three songs in the Top Ten, according to Forbes, and Florida Georgia Line (Brian Kelley and Tyler Hubbard) is the first non-solo act. The last artist with three Top Ten hits was Taylor Swift. The three before her were Buck Owens, Faron Young, and Johnny Cash. Singer-songwriter Dean Miller is co-producing a two-disc tribute album to honor his father, Roger Miller, who died of cancer in 1992 at age 56. King of the Road will be released August 31. It includes songs by Dolly Parton, Ringo Starr, Brad Paisley, Willie Nelson, Kris Kristofferson, Merle Haggard (in one of his last recordings), Kacey Musgraves, and Eric Church. Rolling Stone Country calls Roger “part Hank Williams, part Will Rogers, yet a wholly original talent with a densely populated mind.” Roger Miller was inducted into the Country Music Hall of Fame in 1995. The Lynn Anderson Rose Garden is open to the public at Woodlawn-Roesch-Patton Funeral Home & Memorial Park in Nashville. It includes 114 Hybrid Tea Lynn Anderson Roses. The roses and garden are the project of Lynn’s daughter, Lisa Sutton. Family and friends held a private ceremony on June 15 to officially dedicate the garden. Lynn’s biggest hit was “I Never Promised You a Rose Garden” in 1970. She died three years ago at age 67. Grace Pauline Kelley, the 22-year-old daughter of Wynonna Judd, is behind bars after breaking her probation and being sentenced to eight years in prison. RadarOnline.com reports she pled guilty to meth manufacture, delivery, sale and possession with intent on May 26, 2017, in Williamson County Court. The daughter of Wynonna and first husband, Arch Kelley, has been in and out of prison in Tennessee and Alabama for drug-related charges over the past two years. She was first arrested at a Walgreens in Nashville in December 2015. The 2019 stars on the Hollywood Walk of Fame will include one star for the trio of Dolly Parton, Emmylou Harris, and Linda Ronstadt. Dolly, who received her first star in 1984, will be the first woman in the 21st century to have a second star. Rolling Stone Country says the date for the unveiling of the Trio’s star has not yet been announced. There’s a new and unique country singer on the horizon. Priscilla Renea has released an album titled Coloured. Although she’s written hits for pop artists, she’s a country girl at heart. She and country singer Jake Owen grew up in Gifford, Florida, and graduated from high school in the same class. When people doubt her being a country singer, she asks them what the difference is between him and her, she told NPR’s Michel Martin in a recent interview. “It’s a very real thing for me to have experienced people calling me names. I’ve been called monkey, and I’ve been called the N-word and all kinds of things.” We often talk about how country music is about life, it’s real, it’s about our experiences as human beings. She feels that way, too. “As a black person singing country music,” she says, “this is a part of my experience. There’s so many instances of black people getting pulled over and getting shot, so If I’m going to be honest about what it’s like to be a black female country singer, I have to talk about it.” Concerning the not uncommon belief that most black people don’t care for country music, she has a valid point in saying, “If you think about the kind of people that consume country music and tailgate and go to these concerts, it’s not an environment where black people feel welcome.” She concludes, “I don’t think it’s that black people don’t like country music or that they wouldn’t like to exist in that space, but I’m not going somewhere where I feel like I’m going to get beat up.” I listened to several of her songs, which sound pretty but don’t strike me as country. However, I’m no judge of today’s country music. I wouldn’t call Jake Owen country, either. Priscilla has visited backstage at the Grand Ole Opry. She says, “I want to be on that wall and I want to have my costumes behind the glass case for, in 50 years, another little black girl goes back there and says, ‘Wow, if she did that, I could do it. '” I say more power to her. I hope she makes it. When Craig Morgan returned from his tenth USO tour entertaining U.S. troops overseas, he was presented with The Outstanding Civilian Service Medal at a ceremony in Huntington Beach, California. The award on June 23 recognized his dedication to entertaining troops and their families around the world. Craig served almost 20 years in the U.S. Army before his singing career. Taste of Country reports he also gives back to veterans through his own store, the Gallery at Morgan Farms in Dickson, Tennessee. He and his family run the store and hire military veterans to work there. Diane: I haven’t heard from Robyn, and I couldn’t find any information about his CDs. Diane: The publicity is well-deserved, Les. Congratulations on your Opry debut. 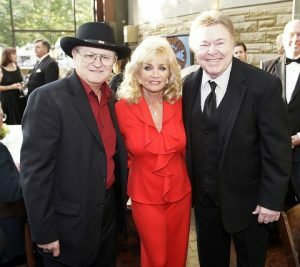 The three people inducted into the Country Music Hall of Fame in 2009 are all alive today. Born into a musical family in Virginia in 1933, Roy Clark won two national banjo championships at age 15. Within five years, he was a professional entertainer in clubs in Washington, D.C., and he appeared on Connie B. Gay’s Town and Country Time radio and TV shows. He joined Wanda Jackson’s band in 1960 and fronted her shows. His first Capitol album, The Lightning Fingers of Roy Clark, was released in 1962. His chart hits as a singer included “Tips of My Fingers,” “Yesterday, When I Was Young,” “I Never Picked Cotton,” and “Thank God and Greyhound.” He co-hosted the Hee Haw TV series for its 25-year existence. In 1983, he became the first country performer to open his own venue in Branson, Missouri: The Roy Clark Celebrity Theater. His seven CMA awards included Entertainer of the Year in 1973. He was named ACM Entertainer of the Year in 1972 and 1973. Roy Clark, 85, lives in Tulsa, Oklahoma, because, he says, “Oklahoma is centrally located, easy to travel from coast to coast, and to Nashville.” He owns a collection of more than 100 mandolins, banjos, guitars, and steel guitars. Beautiful and super-talented Barbara Mandrell was born in Houston, Texas, on Christmas Day 1948. Her parents, musicians Irby and Mary Mandrell, moved the family to southern California. Barbara could play accordion and read music when she started first grade; she was learning steel guitar and saxophone at age ten. Shortly thereafter, Joe Maphis put her on his Los Angeles television show, Town Hall Party. The Mandrell Family Band, consisting of Irby, Mary, Barbara, and drummer Ken Dudney, began playing military bases when Barbara was 14. Ken and Barbara married when she was 19. He joined the US Navy as a pilot, and Irby started managing Barbara’s recording career. In 1981, she became the first person to be named CMA Entertainer of the Year twice. When the NBC-TV show, Barbara Mandrell and the Mandrell Sisters, began in 1980, I never missed it. Besides enjoying the musical talent, comedy, and acting, I admired the gowns worn by Barbara and sisters Louise and Irlene. They always matched in color and overall design with different sleeves and bodices. The show ended in 1982 because of damage to Barbara’s voice. Two years later came the injuries from her devastating car crash. She returned to performing, until announcing her retirement in 1997. She’s seldom been seen since. Now 69, Barbara Mandrell spends her time with her family and her hobbies and crafts. Born in West Virginia in 1941, Charlie McCoy grew up in Miami, Florida, and started playing harmonica at age eight. He moved to Nashville in 1960, where Mel Tillis connected him with record producers Owen Bradley and Chet Atkins. His harmonica playing demo work led to thousands of recording sessions over the decades. He can be heard on dozens of hit country records, such as “500 Miles Away from Home,” “Orange Blossom Special,” “Old Dogs, Children, and Watermelon Wine,” “Only Daddy That’ll Walk the Line,” “He Stopped Loving Her Today,” “What’s Made Milwaukee Famous (Has Made a Loser Out of Me),” “Take This Job and Shove It,” and “Delta Dawn.” He was named CMA Instrumentalist of the Year in 1972 and 1973. He also played harmonica, bass, guitar, keyboards, percussion, mallet percussion, trumpet, saxophone, and tuba on recordings by non-country artists, including Bob Dylan, Elvis Presley, Perry Como, Gordon Lightfoot, Patti Page, Simon & Garfunkel, Ringo Starr, Joan Baez, Leon Russell, Paul Simon, Nancy Sinatra, and Bobby Vinton. Charlie served as music director for Hee Haw for eighteen years and appeared as featured artist on that show and many others. At age 77, Charlie McCoy is still touring and has an active website: https://www.charliemccoy.com. This entry was posted on Wednesday, June 27th, 2018 at 8:06 am	and is filed under Newsletter. You can follow any responses to this entry through the RSS 2.0 feed. Both comments and pings are currently closed.